I’m looking to replace the smoke unit in my dockside. I’ve done everything I could to make it work. I think it is just a real poor design. Any help would be appreciated. I really would like it to smoke better. Thanks! Depends on how much work you want to do. A small fan driven smoke unit would be cool, but it's a bit of work to accomplish. I have found the original smoke unit puts out decent smoke for the unit. Have you tried rebuilding or replacing the original unit? Maybe the heater is not touching the wicking? I'd like to know this as well. I pulled the piston unit out because it just kept binding up. When I did pull it out I saw it was all scratched up. I tried cleaning it and putting it back together, but it kept binding, the piston always got cockeyed and stuck no matter what I did. But if I could put a fan unit in mine, that would be great as then I'd get synchronized smoke with sound since I put a DCC decoder in it. GRJ can you give me an explanation of a suitable fan driven option? Which one to use, and where to get. I have had great luck with repairing lion chief plus units. I am running this loco by conventional means. I was actually hoping you would chime in on this one. Chuck, yes the wicking is touching, I’m just not getting airflow with that crummy piston setup. 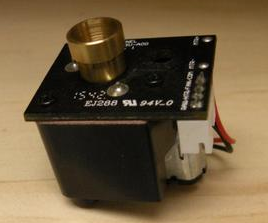 Maybe a "micro pnumatic pump"? Remove the piston and youd have some room. I never priced them but some can fit on a quarter, and are about that tall too, maybe half that wide.. Tap the present hole for a tiny fitting and connect by a tube. Watts used driving it might be high draw and need a board made too...??? If all else fails, maybe reaming out the cylinder hole a tad to allow more airflow? Look at something like the LC+ smoke unit, it's a compact fan driven smoke unit, I put that into a small unit and it worked out well. See previous post. For conventional, you'd need additional logic to control the chuffing fan, and you would have to change the smoke resistor. I’m not to concerned about chuffing synchro, did you get that direct from Lionel? Chuck, if I knew where that hole is, I would do that. But I looked all over that little unit and I’ll be darned if I can figure where that is. Take the smoke unit to a gun store and by a bire swap that is a tight force fit. Get some polishing roug. chuck the swap up in a power drill, load the swap up with some rought then use the drill and swap to polish the interior odf the cylinder. Once the cylinder is polished, the piston by chuck it in the drill and hand hold the swap while spinning the piston. Once that is done, cjeck the piston for a groove cut in its circumfrance, it is for an O-ring. Refresh the O-ring with the porper replacement from Lionel. Once all that is done, lube the pison with a very light coat of vasoline and reassemble. Should work as new. I have a lathe so the piston polishing did not require an extra set of hands.